Free Shipping Included! 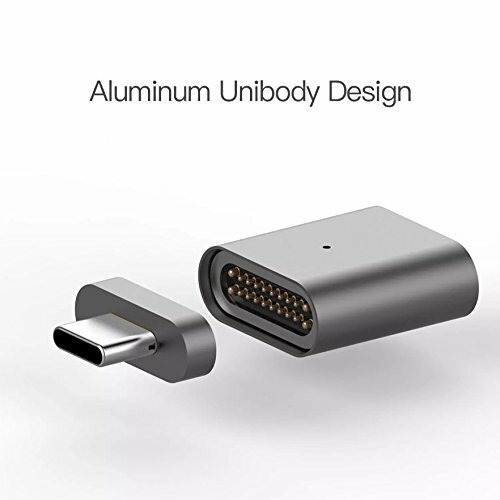 USB C Magnetic Adapter for MacBook Pro 2018 Magsafe Magnetic Adapter 87W Magnetic USB C Adapter Fast Charging USB Type C to USB C Charger Converter for USB C Device(Gray Space) by Snapnator at Andy Pemberton. Hurry! Limited time offer. Offer valid only while supplies last. Meet the ''MagPlug'' - Magnetic Charger like Griffin Breaksafe Cable or Apple Magsafe Adapter. Tired of being always wired while using your laptop? Meet the "MagPlug" - Magnetic Charger like Griffin Breaksafe Cable or Apple Magsafe Adapter. convenient! Charging speed is top standard - up to 87W (20V - 4.3A). Magnetic Charger Adapter "MagPlug" is perfect for MacBook, MacBook Pro, Google Pixel 2, 2 XL, Pixelbook, Samsung Galaxy S8, S8 plus,Note 8 and other models. ThinkPad, Dell XPS and other models. HTC 10, MOTO Z, LG G5, Nexus 5X/6P and other models. View More In USB-to-USB Adapters. If you have any questions about this product by Snapnator, contact us by completing and submitting the form below. If you are looking for a specif part number, please include it with your message.